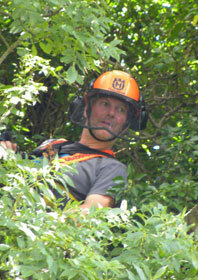 We have full insurance, qualifications, and a wealth of experience to carry out your tree work requirements. light pruning of trees and hedges . We are an approved contractor for Sheffield City Council, and liaise closely with the Environment Agency to ensure our knotweed control is carried out to the highest industry standards. We use stem injection to ensure operations have minimal impact on the environment. Greentree Landscape Management is based in the south west of Sheffield, and has been keeping landscapes and trees looking good since 2003. Over that time we have carried out hundreds of jobs, large and small, for local authority departments, charities, conservation groups, private companies, large private landowners as well as individual home owners. We work with clients in South Yorkshire, Derbyshire, North Notts and West Yorkshire. We pride ourselves on offering a diverse range of skills, with the experience and qualifications within our team to match, and have a comprehensive range of specialist equipment. This allows us to offer a competitive price for virtually any landscaping or land management requirement without the need to sub-contract out. This means that as a customer, you are guaranteed our full attention with every aspect of every job.